To put this into context, last week,Â 4,376,635 people in this country voted UKIP, so if 86% of them voted UKIP in next year’s General Election, UKIP would receive at minimum 3,763,906 votes, in 2010,Â 919,471 people voted UKIP in the General Election. If this there were to happen, it would make the next General Election very hard to predict, as last week showed UKIP polled very well across the country, from the Tory heartlands, to Labour’s heartlands such as winning the vote in Doncaster and narrowly finishing second behind Labour in Wales. We could see all sorts of unusual results next year. We could more results like what we saw inÂ Inverness, Nairn and Lochaber in the 1992 General Election, when the winning party won the seat with 26% of the vote, and the fourth place party a mere 3.4% behind first place. I hope more pollsters start polling questions like this, because how UKIP supporters and 2010 Lib Dems supporters vote in next years’s election are going to be the two main factors in determining the account of that election. Survation last week found that 71% of UKIP Euro voters would vote UKIP at the next General Election, so this 86% isn’t that outlandish. Cockroach-like.Â That was Tim Farronâ€™s description of Lib Demsâ€™ resilience in withstanding a hostile climate.Â The inference was that no matter how tough things might be across the country, where they have elected representatives, their vote would hold firm enough. He had a point: Lib Dem MPs and councillors have in the past proven notoriously difficult to shift due to local campaigning, popularity and hard work and their being transfer-friendly to tactical votes.Â Is it still true though?Â The recent constituency polling Lord Oakeshott commissioned suggested strongly not, though it should be noted that the methodology ICM used was unfavourable to his former party. 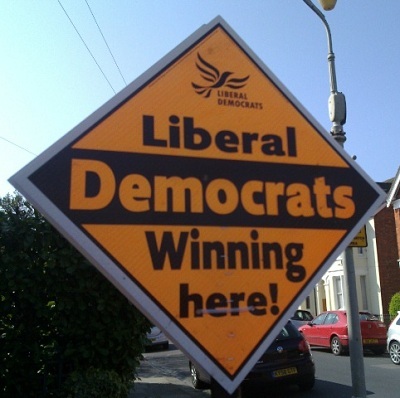 A betterÂ case studyÂ was the local elections: for every four seats held last week, three were lost.Â Not all of them will have been in constituencies the Lib Dems represent at Westminster or even ones theyâ€™re competitive inÂ but by definition they must have been locally strong in the relevant wards and yet more than 40% defended still went down.Â The same rate of loss at a general election would leave the YellowsÂ with 33 MPs. In some ways, that wouldnâ€™t be at all bad: to lose half your vote but keep more than half your MPs would be good going, especially under FPTP.Â After all, 33 MPs is considerably more than the Liberal-SDP Alliance won in the 1980s on close to three times the current polling. Incumbency can only hold out against the tide so far though: there comes a point when there simply arenâ€™t enough votes to go round to return large numbers of MPs: UNS cannot apply at the bottom end because you canâ€™t lose (say) 14% in a seat where you only had 8% to start with.Â Of itself, that means that more have to come from the middle or top to make up the difference.Â If we further assume that the top end also outperforms because of incumbency, that implies a tremendous and probably unrealistic collapse in the middle. To give an example, suppose the Lib Dems poll 9% at the election.Â On the same turnout as 2010, that would reduce their votes received from 6.8m to 2.7m (not that the turnout really matters but keeping it the same removes one variable).Â If they polled 30% in twenty seats, 35% in another twenty and 40% in a further twenty, that alone would be close to a million votes â€“ and those shares might well see them win the 33 mentioned above.Â It would, however, leave just 1.7m to be spread across the 570 other constituencies at an average of just 6.4%.Â With presumably other seats where the Lib Dems have a reasonable showing, itâ€™d imply near-extinction levels across many and lost deposits in about half. If Polling into single figures is inconsistent with keeping the substantial majority of seats presently held but the question is which side which part will prove to be false.Â One clue could be provided if the polling companies routinely asked people to think about how theyâ€™d vote in their constituency.Â We know this can have an effect on responses and as everyone does vote in their constituency, thereâ€™s no real reason not to phrase it like that.Â If there is an incumbency bonus, doing so might bump up the polls and square the circle. Â On the other hand, if the polling is right â€“ and present figures lie smack bang between the Lib Demsâ€™ actual scores in the locals and Euros, just as youâ€™d expect â€“ then the Yellows are in for big losses. The Ipsos-Mori issues index is out for May. Largely it is no change for all voters. The issues through Kipper eyes. With one year to go, I thought it would be useful to track how Ed and Dave compare to their predecessors one year before a General Election. I’ve been using the ratings from Ipsos-Mori that go back nearly forty years and are considered to be the Gold Standards of leader ratings. Looking at the Leader of the Opposition net ratings, sometimes the figures speak for themselves. Only Leaders of the Opposition Â with net positive ratings one year have gone onto become Prime Minister and only Michael Foot, generally regarded as the worst Leader of the Opposition since the war, polls worse than Ed while William Hague, Michael Howard and Neil Kinnock had better ratings than Ed and didn’t become Prime Minister. Whilst we do live in a more cynical, anti-politician era, so that may explain Ed’s ratings, that said, in the same point of the electoral cycle, David Cameron was polling a net plus 23, nearly 50 points ahead of where Ed is today, and that was only five years ago. Moving onto Prime Ministers ratings, it is a bit harder to discern a pattern. The most amusing thing I found was Dave’s rating was exactly the same as Tony Blair’s rating in his first term,both in net terms, and the individual figures, 39 positive, 52 negative, David Cameron truly is the heir to Blair. Looking at the leads the PM enjoys over the Leader of the Opposition, the longer a PM stays in power, ultimately they become less popular, but even then they do recover. The fact Jim Callaghan had a lead over Margaret Thatcher should give Ed some succour, but will there be an equivalent to the Winter of Discontent? Before Labour supporters get too despondent, Ed does enjoy some advantages that his predecessors do not, such as the electoral geography favouring Labour, and the great known unknown of UKIP which could make the 2015 General Election like no other. Congratulations to Wulfrun_Phil to winning the competition, thanks to everyone who took part, and a big thank you to Mark Hopkins to setting up the website for the entries. 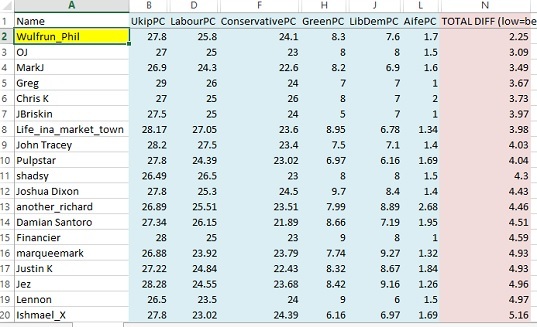 Just a note, on the above picture, I’ve hidden the individual differences for each party column (so not to make the above picture unreadable) the total diff column is the sum of these individual columns. A link to the spreadsheet with everyone’s entries and rankings is available here. The Tories are ahead in this poll for the Sun by Survation, but down nearly 18% since the general election, but with a strong campaign, I can see either UKIP or Labour winning, the fact that UKIP are up over 24% since the General Election, compared to 4.7% that Labour are up since the election, shows the momentum is with UKIP. 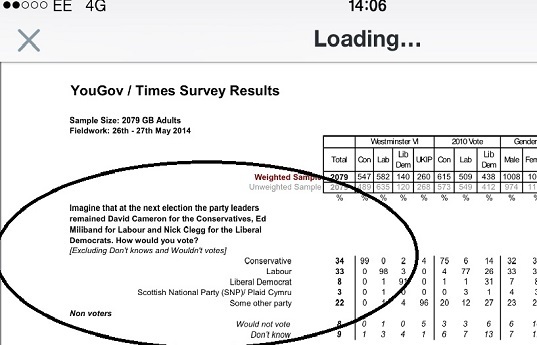 The normal caveats that this just one poll, this raises an interesting dilemma for Labour, and their supporters? Or do they vote tactically for UKIP? Tough times if you’re part of the tactical voting Tory alliance, we will find out next week. You can back Labour at 33/1 and UKIP at 3/1, I will avail myself of these odds shortly, if they are still available. Final figures show that UKIP won 3.8% of council seats on May 22 – down from 6.2% on 2013. Now the first thing that caught my eye was the fact that the Tories are ahead with YouGov for the first time since March 2012. Sadly for my bets with Paddy Power, this can’t be considered a Tory lead/crossover with YouGov. The changes from the normal question conducted at the same time for the Sun using the same panel (sample size of both is the same) is Con plus 2, and Labour minus 1. The most interesting finding is that mentioning Ed’s name has no major change for Labour, mentioning Dave’s name is a boost for the blues, but well within the margin of error. My only caveats are that is only one poll, and in the past when Ed’s name was a drag, it was generally when Labour were polling in the 40s and had leads of around double digitsÂ so there maybe much less opportunity for drag available as Labour’s support has fallen since then.